No doubt, Nintendo 3DS players are pretty excited to have a go on 50 Classic Games from the developer, Maximum Games, what with the excellent reviews that 42 All-Time classics (Clubhouse games if you’re from North America) received, and at first glance, this excitement would appear to be reasonably well founded. As you can imagine from a game entitled 50 Classic Games 3D, this game features fifty of the classic board, table and card games that have been played in homes, schools and pubs for hundreds of years now and they are all played in 3D, using Nintendo’s fantastic parallax 3D auto stereoscopic 3D system. Players can choose from the likes of chess and chequers, poker and blackjack and all sorts of other table and card games, including slightly more modern games such as bubble shooter. Most of the games are pleasant to play and smooth to operate and thanks to being very familiar, there is very little learning time necessary before players can really get stuck into them. The games that perhaps haven’t been executed quite so well are the more modern games, which seem to lack a bit of style and substance at times. The reason behind this, in the most part is fairly simple, the games have only one difficulty setting meaning players are either baffled or simply not good enough to enjoy the games or are in fact too good and find the games too easy. It wouldn’t have taken much to remedy this situation so perhaps something an update would put right. Another very obvious shortfall is there are no scoring systems in any of the games and obviously therefore no saving feature. That means that players are only competing against the game itself, there is no way of trying to self compete or in fact compete against anyone else. This somewhat detracts from the overall experience and limits the enjoyment that can be gained from playing 50 Classic Games 3D. 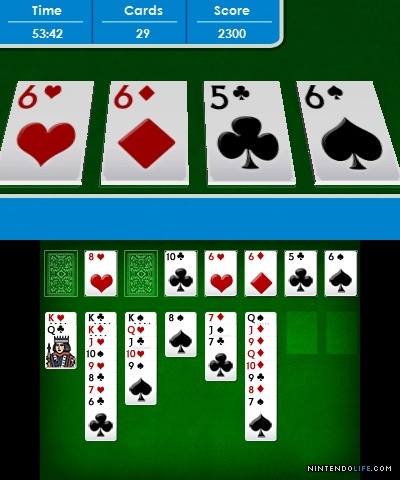 The graphics and music aren’t too bad and thanks to the games being relatively simple in nature, everything runs smoothly during game play, meaning it is easy to play for a considerable length of time before becoming tired but the most impressive thing is probably how the dual screen is utilized in this offering. Most of the games incorporate the second lower screen of the console and this feels very natural, making swiping and dragging movements. 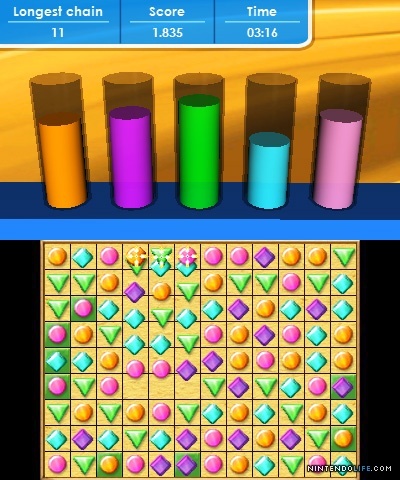 Overall, a reasonable game that gives players access to a wide range of relatively well designed games and puzzles. It isn’t going to win any design or game play awards but it also isn’t going to have players throwing their console at the wall. Probably not as much fun and as well thought out as 42 All Time classics, which will no doubt remain as the big dog in multiple offering games but if you are just looking for a good selection of games to entertain you on the commute, probably worth a pop.